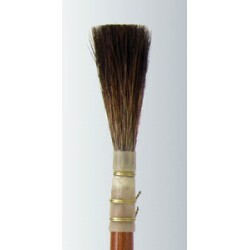 Buy 2100 Series Lettering Quill Brushes Brown Kazan Squirrel by Scharff Brush here, brown quill lettering quill brushes for Sign Painting. The Lettering Quill brushes brown series 2100 is normally used for medium to small lettering. It can also be used as a fill-in brush and an out-liner for large letters. The long hair length allows the brush to carry a lot of paint. The brown quill is also handmade and its equally as important as the gray as an essential brushes for sign painters and Pinstriper's. The series 2100 is a universal lettering brush. It is used for general commercial work such as: signs, truck lettering, boats, etc. The Brown Kazan Squirrel hair in the Lettering Quill brushes brown series 2100 is more durable than most brushes, and this brush is suitable for lettering on most surfaces. 2100 Series Quill Brown lettering Quill Scharff for hand lettering that are made from Brown Kazan Squirrel hair is much softer than hand lettering quills made from grey squirrel hair. These sign painter brushes come with Amber Varnished wood handles. Brown Kazan Squirrel hair quills have graduated hair lengths. This brown Lettering Quill brushes brown 2100 is handmade by highly specialized brush makers. This lettering quill is an must have in every sign painter's kit. The brown quill is best suited for smooth surfaces such as glass or automotive surfaces. It has a round ferrule and the hair comes in graduated lengths. Series 2100 Brown lettering Quill Scharff also available in 0, 1, 2, 3, 4, 5, 6, 7, 8, 9, 10 and 12. Other terms for these brushes are Quill Lettering Brushes, quills for lettering, hand lettering quills, quill sign brush, lettering brush, sign painter brush, sign painting brushes, brown quills, brown quills, brown quills and Scharff brush company quills. Brown Squirrel Quill Brush Series-2100 Size 1 Brown "Kazan" Squirrel Lettering Quills Kazan Brown Squirrel Quills Made with the finest..
Brown Squirrel Quill Series 2100-Size 10 Brown "Kazan" Squirrel Lettering Quills Kazan Brown Squirrel Quills Made with the finest Brown..
Brown Squirrel Quill Series-2100 Size 10 Brown "Kazan" Squirrel Lettering Quills Kazan Brown Squirrel Quills Made with the finest Brown..
Brown Squirrel Quill Series-2100 Size 2 Brown "Kazan" Squirrel Lettering Quills Kazan Brown Squirrel Quills Made with the finest Brown ..
Brown Squirrel Quill Series-2100 Size 3 Brown "Kazan" Squirrel Lettering Quills Kazan Brown Squirrel Quills Made with the finest Brown ..
Brown Squirrel Quill Series-2100 Size 4 Brown "Kazan" Squirrel Lettering Quills Kazan Brown Squirrel Quills Made with the finest Brown ..
Brown Squirrel Quill Series-2100 Size 5 Brown "Kazan" Squirrel Lettering Quills Kazan Brown Squirrel Quills Made with the finest Brown Kazan Squi..
Brown Squirrel Quill Series-2100 Size 6 Brown "Kazan" Squirrel Lettering Quills Kazan Brown Squirrel Quills Made with the finest Brown Kazan Squi..
Scharff Brush Series-2100 - Size 7 Brown "Kazan" Squirrel Lettering Quills Kazan Brown Squirrel Quills Made with the finest Brown Kazan Squirrel Hair..
Brown Squirrel Quill Series-2100 Size 8 Scharff Brush Series 2100 - Size 8 Brown "Kazan" Squirrel Lettering Quills Kazan Brown Squirrel Quills M..
Brown Squirrel Quill Series-2100 Size 9 Scharff Brush Series 2100 - Size 9 Brown "Kazan" Squirrel Lettering Quills Kazan Brown Squirrel Quills Made w..